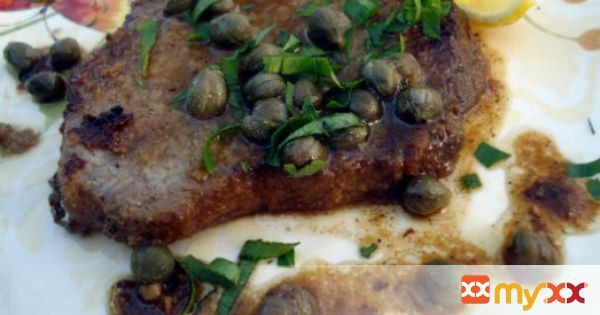 Simple, succulent steak is made heavenly delicious with an easy, tangy lemon and caper sauce. Made in 25 minutes. 1. Flatten the steaks lightly with a meat mallet. Combine flour, salt and pepper, dip steaks into the mixture, coating both sides. 2. Sauté the steaks in a hot mixture of butter and olive oil over medium heat, about 4 minutes on each side. Remove from the pan and set aside. 3. Sauté the garlic in the same fat for about 1 minute, stirring. 4. Add the wine and lemon juice, stir and simmer for 5 minutes to slightly reduce the liquid. 5. Add capers, stir. Return the steaks to the pan, cover and simmer over low heat for 4 minutes.